It is itself part of a wider Dh1 billion mixed-use development that will also host Dubai’s first “water-homes”, fully anchored in the water and with access via boats as well as walkways. These properties have not gone on sale as yet though Dubai Properties has already gone through fairly extensive marketing activities on these, including targeted at overseas investors. Apart from the water-homes, Marasi will have three themed areas — The Marina, The Park and The Pier — and to be completed in phases by 2023. Phase 1, comprising The Marina and The Park, is on track for delivery in the fourth quarter of 2017. Developers are in a race to come up with some of the most enduring attractions along the latest water body in the city. The likes of Damac have already announced tower launches — Aykon City — centred on this stretch. Habtoor City has its hotels and three residential skyscrapers — only one of the three has had a sales launch to date, according to a top official at Tamleek, the estate agent. Market sources confirm that as such there will only be a limited number of plots that can lay claim to being right on the waterside along the Water Canal and, consequently, charge a premium. According to Reidin-GCP data, of the 8,500 units launched off-plan in the year to end September, a third of them can be described as luxury and the others being more mid-market in bearing. In January, this split was more or less even. With the recent launches of Kempinski Residences in Business Bay — offering 800 apartments — and the new Address, luxury launches should show some upward mobility in the final quarter. (To place things in perspective, in the boom years for Dubai realty, luxury represented 80-90 per cent of all launches.) 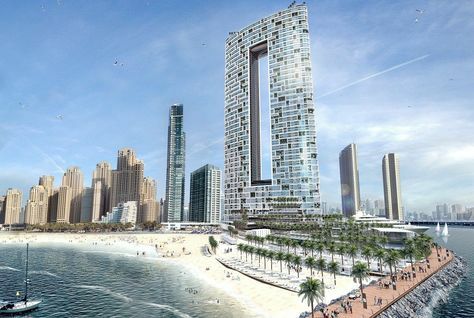 In the near term, Dubai’s off-plan launches could also have a distinctive waterside story to tell. There are those the Water Canal will play host to. Then there is the Dubai Creek Harbour — where the world’s next tallest structure, The Tower, will be built — will also offer developers the chance to showcase its waterside possibilities. Things are also happening by the beachside — Emaar is launching sales this week of super-premium apartments at the new Address branded hotel and serviced residences in the Jumeirah Beach Residence cluster. Apartment prices could be in the region of Dh2,500-Dh3,000 a square foot, according to market sources. Emaar has also released additional units at Dubai Hills Estate, part of the massive MBR (Mohammad Bin Rashid) City. Again, these homes skew higher in terms of price points. If an investor prefers a lagoon for a water body, MBR City will even have that option, courtesy Sobha Properties adding this feature within the District One enclave. Clearly, there are no dearth of possibilities. “Given the lifestyle of the city, superior locations, ample beach access and sea views, the city has been well-positioned to offer such luxury price ranges,” said Lakhani. * Marasi Business Bay will have direct connectivity to the main transport arteries Shaikh Zayed Road and Al Khail Road. The Park — set on 50,000 square metres — will have 16 parks with water features as well as a dedicated events space with an amphitheatre, outdoor cinema and weekly markets. * The Marina at Marasi will have 1,250 berths along with more than 100 floating retail and F&B outlets.